This week's Wednesday Hit List post will probably come as a total shocker to everyone! 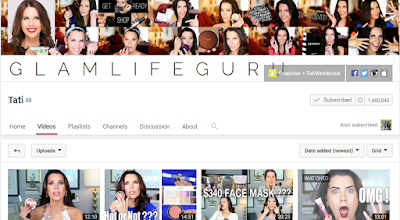 But I am pretty excited to share with you all my 5 most favorite beauty YouTubers. If you don't know me and even if you do, you might be will be surprised to know that I have a huge obsession with beauty YouTube videos/channels. It all started one day when I was at work and I randomly noticed how cheap E.L.F. products are. I decided to Google 'best E.L.F. products' and the first thing that popped up was a Kathleen Lights video... and down the rabbit hole I went. The next thing I knew I was 10 videos deep and couldn't stop. Six months later and not much as changed. The reason why this is so shocking to most people (and to myself as well) is because I rarely wear makeup. Besides mascara (that I wear on days I work), I put on makeup about once a month. It's not that I don't need to, because trust me I do, it's just that I don't make it a priority each day and I don't like putting product on my skin ( I have really sensitive and just overall not good skin). I always feel like putting on make-up is going to make my skin even worse and taking it off every night is too much of a process for me. So it is really absurd and totally ironic that I know more about make-up than 90% of the population, but I rarely ever wear it. 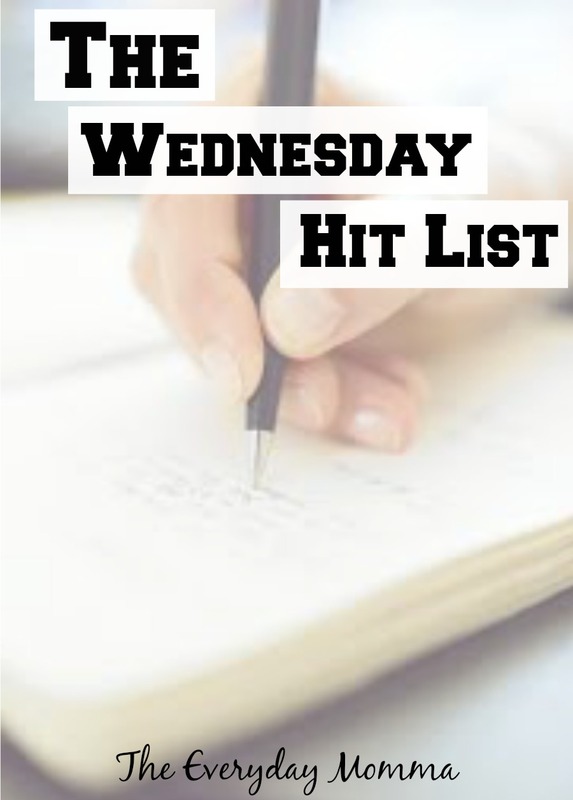 Now that you have that little background, let's get to my list. I am counting down from 5 to 1. 5. Tati: Oh my Tati. 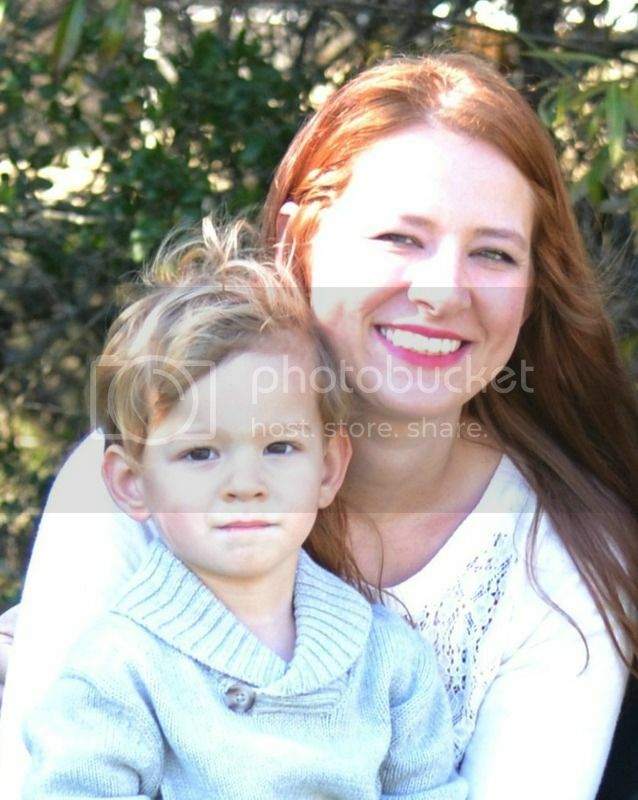 I have grown to love this woman. Her channel is all about the products. If there is a new product out and you want to know about it, go to Tati. She reviews more products than I ever knew existed, both high-end and drugstore. She does a lot of first impressions where she tries something for the first time, tests it throughout the day, then checks back in at night to give the full review. She also does a fair amount of disappointing products reviews, which many other YouTubers try to stay away from, but I love. In general, her channel is just chalked full of so much information it's incredible. I love her because she is honest, super hardworking (she uploads a new video every weekday), and classy (but not stuck-up)! 4. 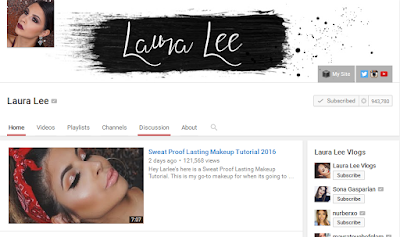 Laura Lee: To be honest I wasn't so sure about Laura at first. It took me a while to really get what she was all about. Some people seem to take issue with her voice, but I adore her accent and have no issue with the tone and pitch of her voice. What I had a hard time with, at first, was her humor. In the beginning, I thought she was just trying too hard to be weird and different and her goofiness seemed forced and unnatural. But the more I watched her, the more I started to see that she was honestly just being herself. I think it helped when I started following her on SnapChat and I was able to see her in her natural environment. It's funny now because I enjoy her jokes and humor; she can get a laugh out of me! Laura does your typical tutorials, hauls, first impressions, etc., but she also does some really fun and unique videos as well. I love when she tests out hacks and she has some great dupes videos. And, of course, she is just gorgeous! 3. Manny MUA: Manny! I had a hard time deciding between my 2 and 3! I adore Manny, like please be my best friend for life, type of adore. He is soo funny and definitely not bad to look at, a.k.a. ridiculously handsome! I love his channel because I just love him. He is so personable and every time you watch him, it feels like you are just hanging out, having casual conversations with him. It doesn't even matter what his video is about, I just want to watch it because I love his presence. He always does a little blooper reel at the end of his videos and I laugh every time. 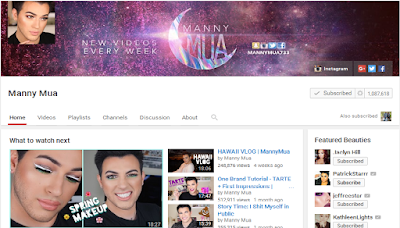 Even if you don't care a bit about make-up, go watch his videos, it will make you a happier person. Speaking of, I am going to go do that right now! 2. Kathleen Lights: These last three are really all tied for number 1. Like I said earlier Kathleen was the one who started it all for me. I'm not sure I would have fell so hard down that rabbit hole had it not been for Kathleen. From the moment I watched that first video, I just loved her. She is a woman crush for sure; funny, sweet, and gorgeous. But to be honest my favorite part about her is her Cuban accent. I could listen to her talk all day. I never knew how much I loved Cuban accents before I found her. And the way she describes her family and growing up Cuban in Miami makes her even more likable. If you like more soft, subtle looks, Kathleen is the best one to follow. Although she does do more bold looks sometimes, she nails the natural, but flawless look. And she is the only one that doesn't wear false eyelashes regularly. She does tutorials, first impressions, hauls, etc., but she also does more personal videos as well, which I totally love. She doesn't oversell herself on other social medias. She keeps it to a minimum and really seems to balance her life well. 1. Nikkie Tutorials: I would be surprised if you didn't know about Miss Nikkie. If you don't she is most famous for her Power of Makeup video. It went viral and now has over 30 million views. Nikkie is funny, genuine, and ridiculously talented. She is always coming up with unique content and never disappoints when a new video comes out. I die for her her SnapChat filter series, in which she has created the panda, strawberry, and lion. She also kills celebrity inspired tutorials: Kendall, Kylie, Rihanna, Beyonce, etc. She does a monthly favorites video and has some fun collabs with other YouTubers. I am always thoroughly impressed at any challenge video she has ever done: full face highlight, full face liquid lipstick, no mirror makeup challenge, you would never know that it was a challenge. You can tell she is serious about makeup and her job, but is also so humble. And, of course, I just love her accent (she is from the Netherlands). YouTube is flooded with beauty channels and the information out there can be very overwhelming, so I hope this was helpful in giving some direction! 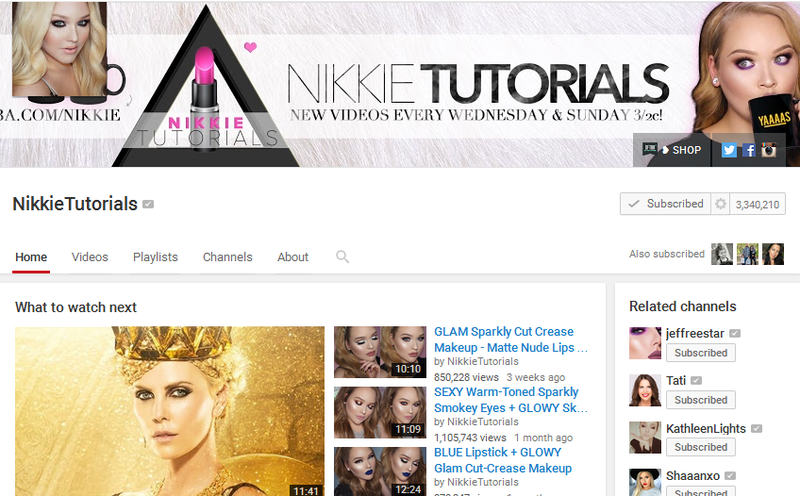 What are your favorite YouTube channels, beauty or otherwise? Again, please let me know if you are interested in this becoming a link-up or even better, co-hosting! It would be open for old and new posts alike; the only requirement is that the post contains a list like a ranking or favorites. I looooooove Kathleen Lights!! I'm checking out the others you recommended. I was watching Grav3yard Girl for a bit when I got her BFF BeautyCon box but she kind of weirded me out too much. 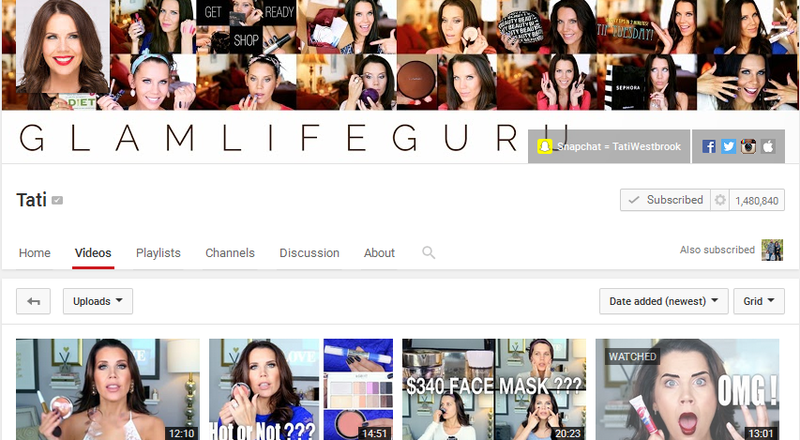 I also liked Meghan Rhienks a lot but she barely uploads anymore and when she does it isn't about makeup. I have watched Bunny a bit too, but I agree that she can be too much at times and her videos are way too long. Some of the more popular ones seem to post less often, which isn't necessarily bad if it's good content. I have never heard of the box. I will have to check it out! My daughter doesn't wear makeup, I barely wear makeup, yet the two of us both enjoy makeup tutorials something fierce. :D She saw your post behind my shoulder and said I've watched Manny. :) It's my fault she's addicted to makeup videos, it started with Halloween makeup, and then we went down the rabbit hole together. So funny that I'm the same way! That's awesome that she knows Manny. 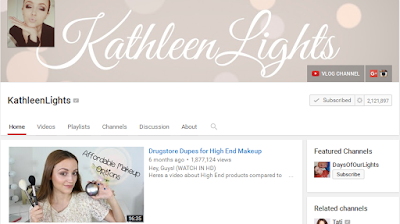 I really like Kathleen Lights for families and younger girls because her channel is really positive and she never cursed or anything. I am so embarrassed to say that I really don't utilize youtube and I totally should! So many great people out there. I do peek at Dr. Pimple Popper (i'm terrible), but not much else, ha! Oh I am intrigued by that gross stuff too! But the older I get the more I get squeamish about that stuff. There is a lot of good stuff out there though. I learned how to use my sewing machine using YouTube videos! I have learned a few things, but I mostly just watch for entertainment. I am so intrigued by their skills and lifestyle!